Hey Vancouver! 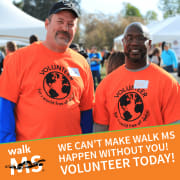 WE need YOUR help to STOMP OUT MS! We need your helping hands to fill critical volunteer positions! Whatever role you play, we make it FUN and MEANINGFUL.